Beginner Friendly - CCC is very beginner friendly! 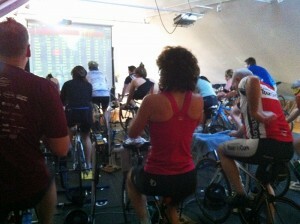 We offer a fun, non-competitive indoor cycling experience. It’s the perfect atmosphere to learn. We will assist you with the simple things-clipping in and out of your pedals, bike fit, when and how to use your gears, etc. Once your comfortable with the simple things we will move forward with the cycling things-how fast to pedal (cadence), how hard to pedal (power), when to work hard and when to rest, etc. Come spring you will roll out of your driveway more confident and stronger than ever!!! 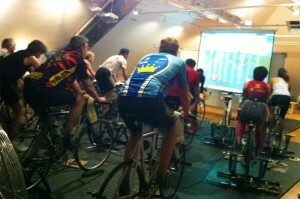 Computrainer - The unrivaled Gold Standard of indoor cycle training for over 25 years. Periodization - New for this season! We will help you reach your performance goals with progressive training. Currently the market is being saturated with indoor trainer options. Computrainer® continues to be the longest standing and most proven to increase your cycling power. Combined with ErgVideo® there is no better training system available. When you train in our studio you are in a non-competitive group environment. It has been proven that training with a group is far more efficient and pushes you harder that training alone. Even if you had the same system at home, you will not see the same results. Using your own bike to train indoors keeps your riding position consistent, reducing fatigue and injury. You will have an extremely efficient workout every time you ride with us. It is easy to target the workout that is most valuable to your needs by using the power zones that we provide based on your threshold test. Then, while riding you can adjust the force of your Computrainer® on the fly. Our combination of Computrainer® and ErgVideo® offer the most simple system available to see your progress in a easy, measurable way. BASE BUILDING - Focus on good riding technique. Builds endurance which lays the groundwork for higher intensity training. MEDIUM TEMPO – Focus on raising lactate threshold power. Medium intensity class. HIGH POWER – Get ready for high end efforts. Targets increasing VO2 max and the ability to recover from repeated high end efforts. Intervals. LONG RIDE – Build those base miles with a long consistent effort on varied terrain. MOUNTAIN CLIMB – Climb the same epic routes of the Tour De France with our real life video experience. Become the billy goat you always wanted to be. A TASTE OF FRANCE – Ride real roads in France right here in Branford, CT! A TASTE OF SPAIN – Same deal only in just as beautiful (and challenging) Spain. GROUP TIME TRIAL RACES – Come race your friends in real time trials. PRIVATE GROUP RIDES – Have a favorite epic ride in France you want to ride with your friends but cannot get everyone over the Atlantic? Want to ride the exact Triathlon course you are training to race on? We book custom studio time to fit anyone’s needs. Individual Session: Reg $30 Sale $20 No Limit! ARRIVAL TIME – If your bike is stored at our facility we recommend you arrive 10 minutes before start time to warm up. When your bike is not stored you need to arrive 30 minutes before start so we can set you up. If you arrive late and we cannot get you set up before start time you will have to wait until the ride is up and running to get set up. Rides that are 2 hours plus you can arrive late and/or leave early if you don’t wish to ride that long. CANCELLATION POLICY – 24 hour notice is required! If you cancel in less than 24 hours and we do not have time to fill your spot you will be charged for the session. No shows will always be charged!